The McNair Scholars Program is a Federal TRiO program designed to prepare students from low income, first-generation, and traditionally under-represented groups for doctoral studies. McNair Scholars participate in courses, seminars, and workshops on topics related to graduate school preparation, complete a paid research experience under the guidance of a faculty mentor, and have the opportunity to present their research at local, regional, or national conference. The McNair program staff works closely with students as they complete their undergraduate requirements and graduate school applications. THE MCNAIR SCHOLARS APPLICATION DEADLINE IS FRIDAY, NOVEMBER 30, 2018. Preparing graduate school applications, scholarship/fellowships and personal statements and research statement writing skills, etc. Dr. Ronald Erwin McNair was an African American physicist and astronaut. Dr. McNair conducted research in the field of developing chemical HF/DF and high-pressure CO lasers at MIT. He also worked with many professionals in the field including the E’cole D’ete Theorique de Physique in Les Houches, France. After he graduated, he served as a staff physicist at Hughes Research Laboratory in Malibu, California where he developed lasers for isotope separation and photochemistry using non-linear interactions in low-temperature liquids and optical pumping techniques. 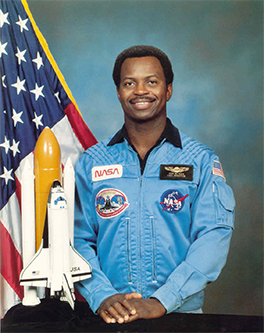 In 1978, NASA selected him for the space shuttle program becoming the second African American to go into space. On January 13, 1986, he was aboard the Challenger STS 51-L mission, when it exploded 1 minute and 13 seconds after its launch. He is survived by his wife Cheryl Moore McNair and his two children, Reginald Ervin and Joy Cheray. Dr. McNair received his bachelor’s degree from North Carolina A&T University and a doctorate in laser physics from Massachusetts Institute of Technology. For his achievements, Ronald McNair received three honorary doctoral degrees and many fellowships and commendations. After his death, Congress provided funding for the Ronald E. McNair Post-Baccalaureate Achievement Program to encourage undergraduate students with similar backgrounds as Dr. McNair to enroll in graduate studies. Thus, the program targets under-represented and low-income, first generation college students. This program is dedicated to the high standards of achievement inspired by Dr. McNair’s life.